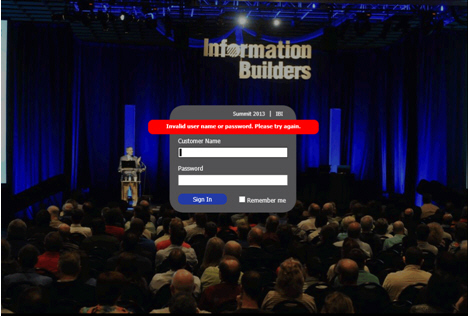 The packaged custom sign in page, as shown in the following image, is made up of a background image that contains a dialog box for the sign in credentials. The background image is centered in a div class, providing some space around the image. To design your page, see How to Design the Page. Decide on whether you will use a background image, a color (solid or gradient), or both. Create a mockup in image editing software that can handle layered PNG files or PSD files, such as Adobe® Fireworks® or Adobe® Photoshop®, respectively. The Open Source Software GIMP can be used to edit the .psd file. Open the provided sample multi-layer image. Replace the background image in the Custom Background layer with your image or colors. Set the alpha transparency to the desired percentage. Note: Not all images will require you to set the alpha transparency. Generally, the value will be between 50-75%. If necessary, resize the canvas to fit your image. Customize the form, as described in How to Customize the Form. Export your image as a .gif or .png to preserve transparency. Place your image in \ibi\WebFOCUS81\config\web_resource\signin\images. Change the background color of the Form Area Background object in the Form Layer to suit your color scheme. Position the form background as desired. Depending on the text you edit in the next step, you may need to resize this box. Determine whether or not the Remember Me feature is used in your installation. If so, turn on the Remember element in the Form Layer. Change the text, as needed in the Form Layer. Style and position all form elements in the Form Layer. Turn on the error message sublayer. Style and position the error message background and text. Turn off the Form Layer, as these items will be generated at run time. The last step is to enable the new page that you have created. Use the following steps to complete this task. 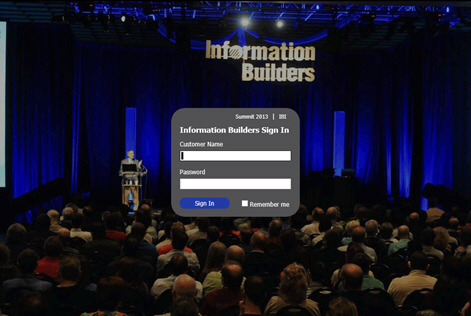 Sign in to WebFOCUS with an administrative account. Launch the WebFOCUS Administration Console. 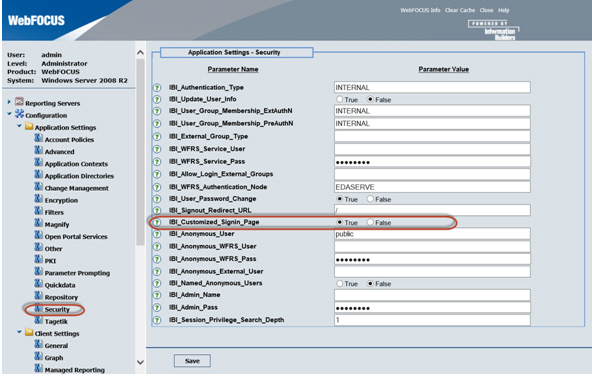 Click Configuration, and then click Application Settings. 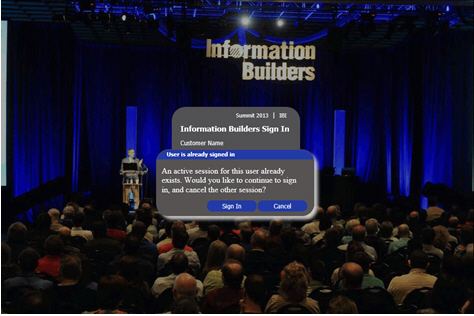 Set IBI_Customized_Signin_Page to true, as shown in the following image. WebFOCUS provides you with the ability to change the text of all labels on the Sign In page. It also gives you the ability to include up to two custom links in the menu bar. In a text editor, such as Notepad ++, edit the customsignin.xml file. Change the text in the desired elements. The following tables provide you with the element, XML tag name, and the default value for that element (which can be changed). The value you enter does not include the XML CDATA wrapper. Note: If you do not see your changes in this section or the CSS section taking effect, you may need to clear the cache in your browser. An active session for this user already exists. Would you like to continue to sign in, and cancel the other session? You have a lot of flexibility when you lay out the custom sign-in page. Styling and positioning are done exclusively in CSS. In a text editor, such as Notepad ++, edit the customsignin.css file. Ensure that your browser zoom is at 100%. Positioning and styling information for all elements can be obtained by selecting the corresponding element inside of your imaging editing software. You may need to slightly adjust the positioning. The following table provides the elements you can edit, their CSS class name, and suggested attributes you may wish to change. Replace all instances of #064e96 with your start color. Replace all instances of # ff7200 with your end color. Change the color in the remaining background attribute to your desired color. Note: Top and left can be used to relatively center the image and all the controls, if desired. Set desired styling, such as font family, size, color, and so on. To hide the separator, set color to transparent. This controls styling, you should apply background colors here. Note: If you need to resize any objects, use the same class on which you set the position. Set desired styling, such as border radius, font family, size, color, and so on. Uncomment the :visibility: hidden; line to hide the image, but keep the space it takes. Use display: none; to remove the image, including the space it occupies. The styling of the elements in the following two tables are inherited from the main page elements. This means the buttons, labels, and controls match to the main page. You may want to adjust left if you do not use an icon. Delete the visibility: hidden; line to show the image. 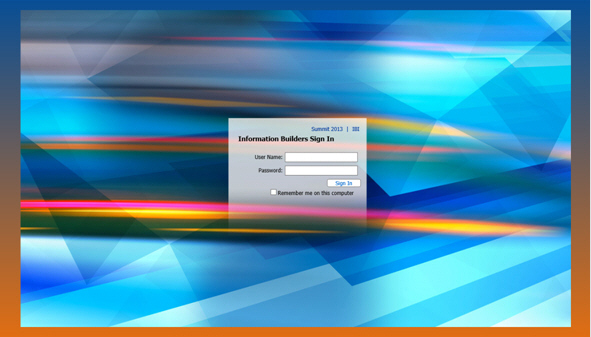 The following is a walkthrough, using the sample image, to implement a custom sign-in page. This assumes you have already performed the design and enable steps. In a text editor, such as Notepad++, edit the customsignin.xml file. Change the text in the following elements. Note: The following table shows only the elements that changed in the example. Enter the value shown in the Example Value column into the XML file. Note: The Remember me option is not enabled by default, but is set in the example files, in case you enable it. The following tables contain the changes you need to make to style the Sign In page and two dialog boxes. Before each table is a screenshot of what you should see when you complete those changes. This class is located at the bottom of the CSS file. Note: To show all edges properly, the width must be at least 5px. Note: Width is 5px more than that of the control to show all edges. Note: Top is 2px less than the value in the artwork, due to HTML rendering. Width and left are matched to the input controls, with right text alignment to align right edge. The following image and table provide information on resolving error messages. Note: Top is the difference between the top of the box and the top of the text in your image editing software. Width here must match the width of class above. Note: This was done to have no image. Styling of elements in the Change Password dialog box, as well as the Already Signed in dialog box, are inherited from the main page elements. This means that the buttons, labels, and controls match to the main page. The following image and table provide information on changing passwords. Note: The visibility: hidden; line will need to be deleted, added again, or commented out during testing. 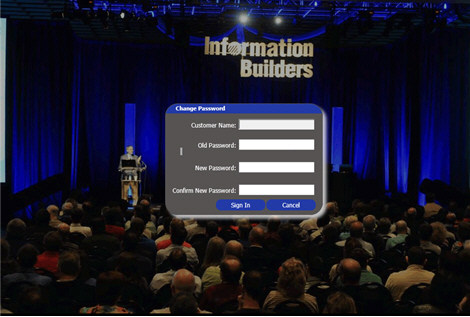 The following image and table provide information on working with the Already Signed In dialog box.